Sometimes there is just nothing better than a quick knit! 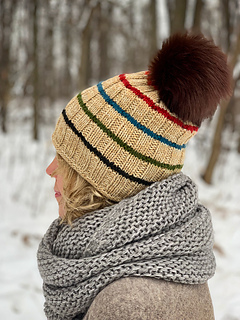 This very quick knit incorporates some of our favorite things: marling, stripes and ribbing. What could be better? It’s the perfect opportunity to showcase some of your favorite Plucky bases too. 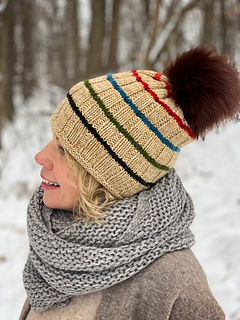 Get creative with the marls and the contrast stripes! 215 yd / 197 m per 60 g) in In A Jif (MC1), and Toasted Coconut (MC2). 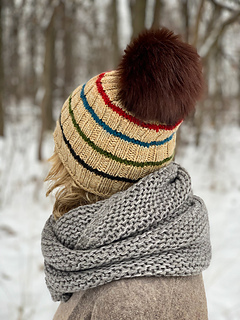 • 1 skein each of Plucky Knitter Halo Worsted (100% cashmere; 115 yd / 105 m per 60 g) in Morticia (C1), Corduroy (C2), Night Light (C3), Peep Toes (C4), and Sockeye (C5).